St. Philip’s Parish was created for Port Brunswick in 1741. In 1748, Spanish privateers attacked and captured the Port of Brunswick and held it for several days. During this time the Spanish flag flew over the parish of Old St. Philip’s. Construction of St. Philip’s Church at Brunswick Town began in 1754, and in the spring of 1760 Royal Governor Arthur Dobbs announced his intention of designating St. Philip’s Church as His Majesty’s Chapel in North Carolina . St. Philip’s was completed and dedicated in 1768, and served the town of Brunswick until the structure was burned by the British during the American Revolution in 1776. 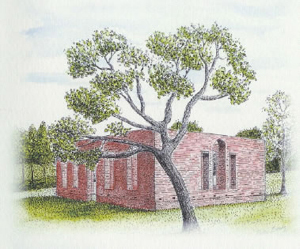 The remains of the original church building still stand at Brunswick Town, preserved as a state historical site off Highway 133, approximately ten miles north of Southport . Supposedly, the altar rail in the Chapel of the Cross at St. Philip’s came from the original structure. The Chapel of the Cross at St. Philip’s Church was erected in 1843. The commander of Fort Johnston at that time, Colonel Thomas Childs, is said to be partly responsible for the church's construction. Evidently Colonel Childs desired a church to serve the fort, and his soldiers were supposedly used as labor to build the church. Today Fort Johnston is directly across the street from our church, and for many years was used by the U.S.. Army as a residence for the Commander and other staff of The Military Ocean Terminal at Sunny Point. The earliest record for a full-time rector was the Rev. Peyton Gallagher, leading St. Philip’s from June, 1852 to March, 1853. 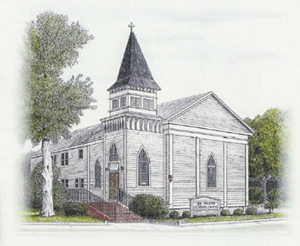 The first vestry was elected in 1850, and in 1851 the parish was admitted into the diocese as “Old St. Philip’s.” It was the intention of its members at that time to perpetuate the memory of the original church of Brunswick Town, through the existence of the new parish. The church continued to flourish, and in an address to the diocesan convention in 1860 Bishop Atkinson reported that he had consecrated St. Philip’s Church in “Smithville,” as Southport was known at that time. In February of 1865 after the evacuation of Fort Johnston by Confederate forces, the church was immediately seized and occupied by Union forces. It was used as a hospital for their wounded, and later as a school for African-American children. From March, 1876 to March, 1878 the church grew and again prospered. A small addition was made to the vestry room and church was enclosed with a “proper fence.” During this period Colonel A.C.M. Pennington and his command of U.S. troops stationed at Fort Johnston were responsible for acquiring a new communion table, alms basin, and lectern. A new organ was also obtained during this period. Since its creation in 1741, St. Philip’s has withstood many changes and challenges. It has worshiped under seven different political flag. 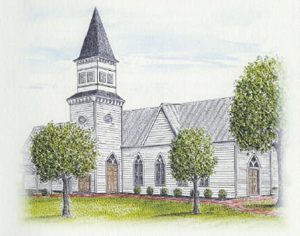 In recent years, the Planning Team and vestry worked on plans to expand our facilities. A careful process of research, parish meetings and surveys built consensus on plans and directions. One of the best church architectural firms in the country, Heimsath Architects, was retained. Through a spiritual and inclusive process, the Heimsath team led us to a Three-Phase Master Plan for future expansion. Phase One is the new worship, gathering and support space that seats 250-300. A magnificent bell tower draws the new church and the current one together into a campus. Phases II & III of the Master Plan include a large parish hall, additional office and education space. On March 30, 2003 ground was broken for Phase One, and on Easter Sunday 2004 we began worshiping in our new church. The old church was renamed “Chapel of the Cross at St. Philip’s” in honor of its original name. The beginnings of the Church of England, from which The Episcopal Church derives, date to at least the second century, when merchants and other travelers first brought Christianity to England. It is customary to regard St. Augustine of Canterbury's mission to England in 597 as marking the formal beginning of the church under papal authority, as it was to be throughout the Middle Ages.